Celtic should have found a new manager before the transfer window because they are going backwards under Ronny Deila, says ex-striker Chris Sutton. The Premiership leaders lost to Aberdeen on Wednesday in the league, which followed last weekend's League Cup semi-final defeat by Ross County. Celtic failed to reach the Champions League group stage this season and were bottom of their Europa League group. "Celtic are judged by the fans in Europe," said Sutton. Deila said he would "never quit" and the Norwegian remains confident of securing his second title for the club in his second season. He is also determined to make an impact in Europe. 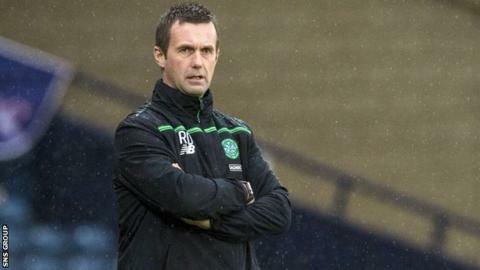 "European football is really important for Celtic," Sutton told BBC Radio 5 live. "I think [chief executive] Peter Lawwell said they need to qualify for the Champions League three years out of every five for their financial stability. "He's [Deila] failed two years running. They had the opportunity to have a new manager come in and buy his own players. "The problem is they thrashed Hamilton and Dundee United at the start of the month and beat Stranraer in the Scottish Cup and everybody was getting carried away. "They were papering over the cracks. Now they can't win the treble now, which Deila was clinging to. However Sutton believes his old team will be Scottish champions for the fifth year running. Asked if Aberdeen could win title, he replied: "No. Absolutely not. "I thought they were decent the other night but Celtic will get the big guns back. Celtic have the biggest budget by far."